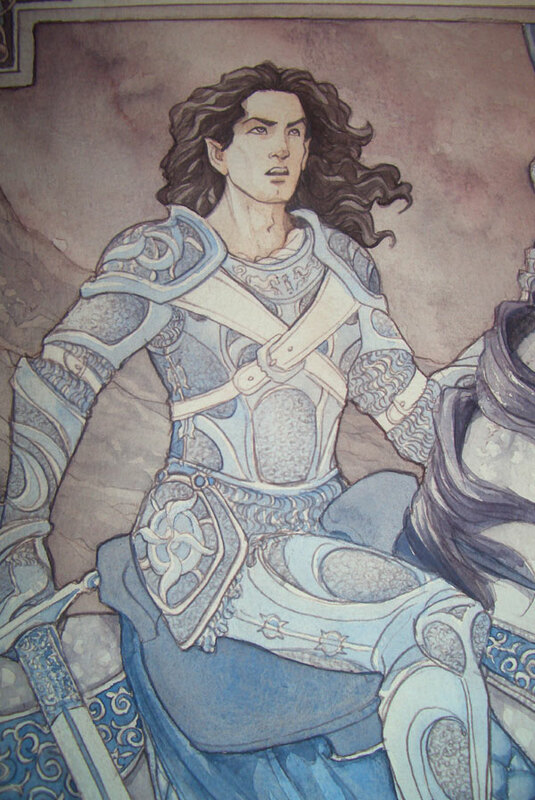 So, I finally got to painting Fingolfin! I’m extremely happy with the outcome – Very often, the colour schemes I go for result in very clear images with very clearly divided colour areas. In this one, I went for much less colour and hue variation so as not to lose all that detail. For the sketching and lineart process, see this entry. I started with a generous background wash of a dull brown, mainly Sepia. I dabbed off some paint from the horse and Fingolfin’s face so they’d stand out more brightly later. The paper I work with is Hahnemühle Veneto, which comes in huge rolls that nobody but me will buy, hence they’re practically giving them away at our local art store. It’s wonderfully cottony in texture and hardly twists, so I don’t have to stretch it. 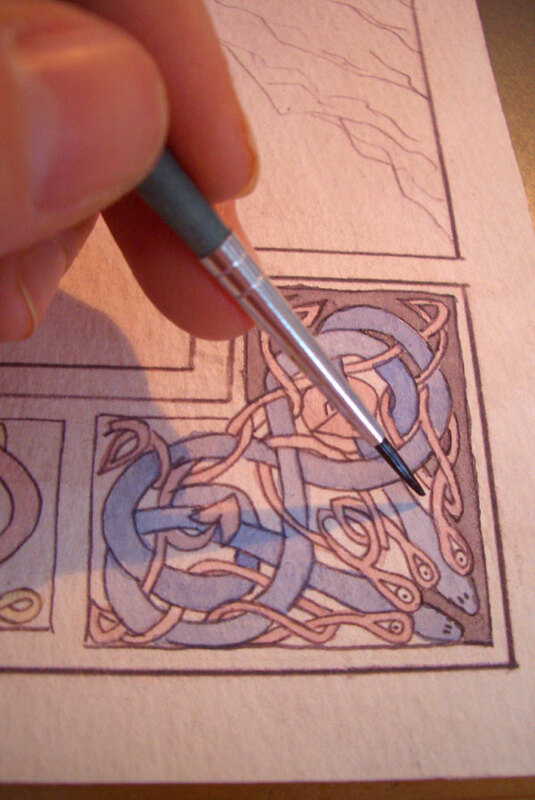 With images like these, I often start with the knotwork. I went for primary colours, but soon saw they looked slightly too baby’s bedroom, so I toned down the blues and reds after the first wash.
Now all the borders are painted. I also darkened the border around the whole image. I just love dapple-greys. And I love to paint them. 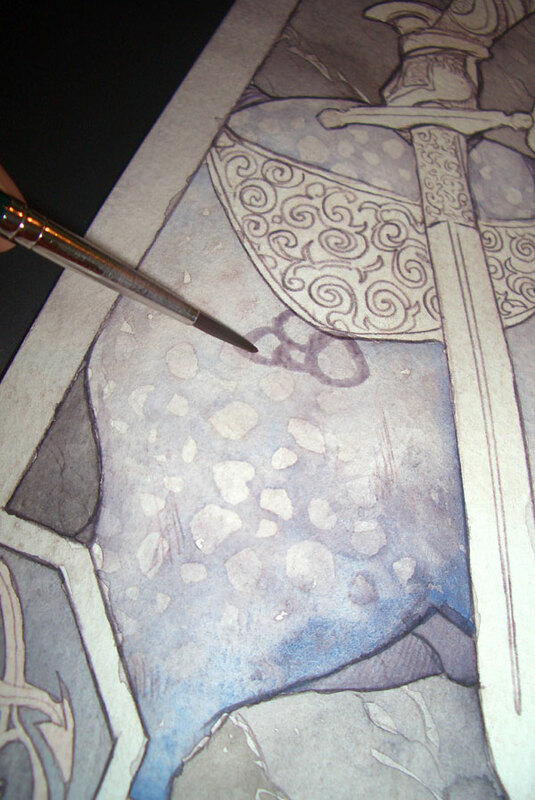 There are several ways how to achieve that dappled look. Initially, I was going to use vodka (yes, you read that right), but the vodka I’m using only works when applied at exactly the right state of drying, which makes working with it quite a hassle. Probably the wrong brand. So, in lieu of alcoholic beverages, I started with painting the dapples, like this.You paint little circles and ovals, making sure they vary in size and spacing, or the final result will look too uniform. In order not to have the dapples stand out so much (we want dapples, not polka dots), I overlaid them with a more unifying wash once they’d dried. 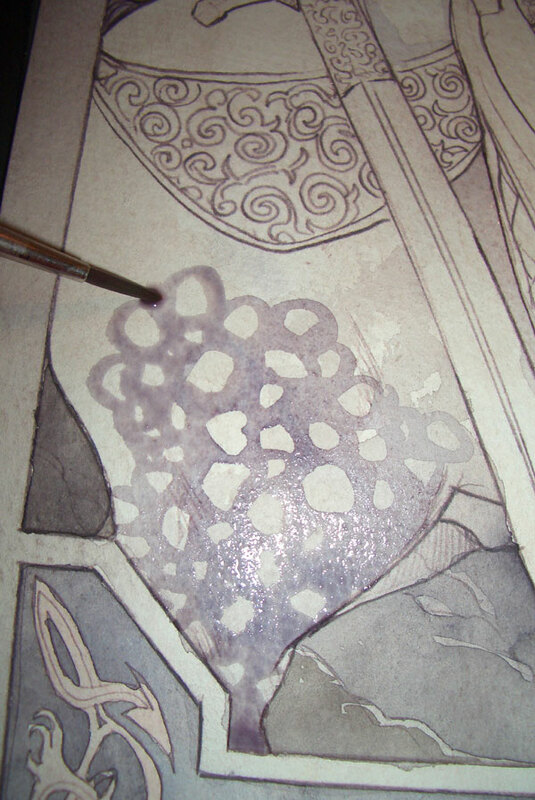 Once that wash had dried as well, I added another dotted wash, exactly like the first. Closeup of the finished dappled rump in the final image. 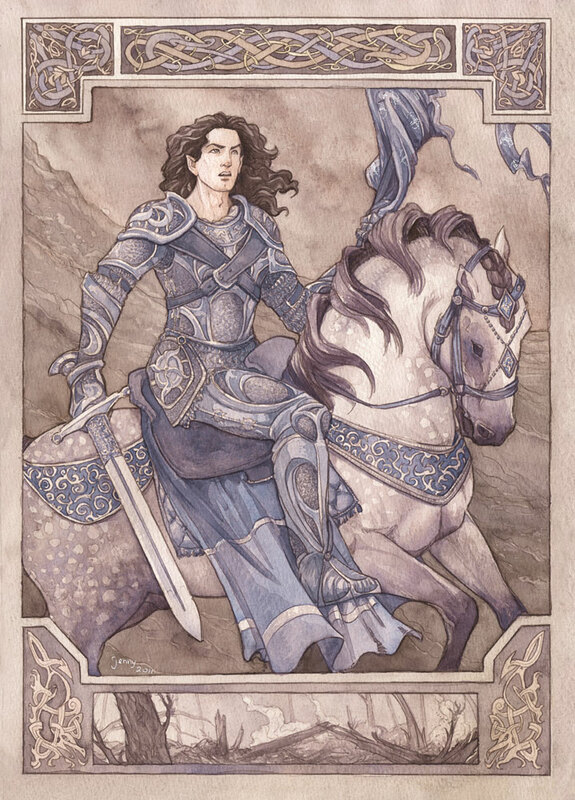 After painting the horse very bluish, I found that the subtle hue variation I’d had in the background was too subtle after all, and put a more reddish wash over it. 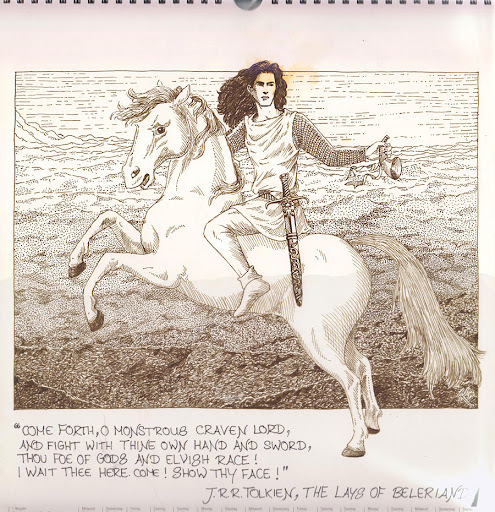 Now Fingolfin stood out nicely without looking as if I’d painted the background in greyscale. 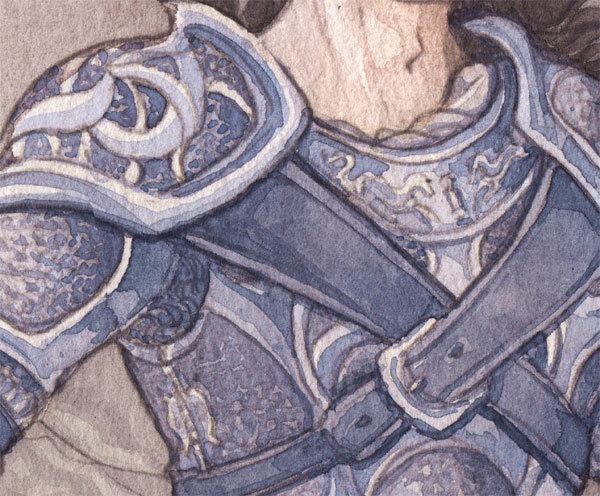 To achieve a metallic look, you need to paint a mix of smooth gradients (for the smooth texture of metal) interrupted by sharp light-dark-contrasts (for the reflections). I started with the first layer. I had three different types of metal: chainmal bits on his arms and lower body, etched plate (on his stomach and other places) and smooth plate. I decided to set them apart by using different blues for them, painting the etched and chainmail bits darker. The two white bits along his torso are leather straps, which I also painted bluish later. Here’s the second wash of paint. 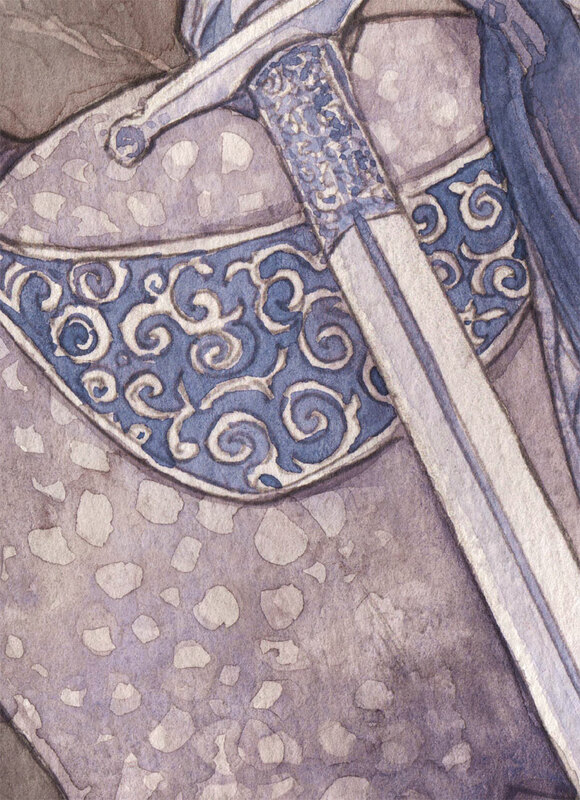 On his gorget (that the collar piece) and the shoulder plate, you can see some metal reflections already. 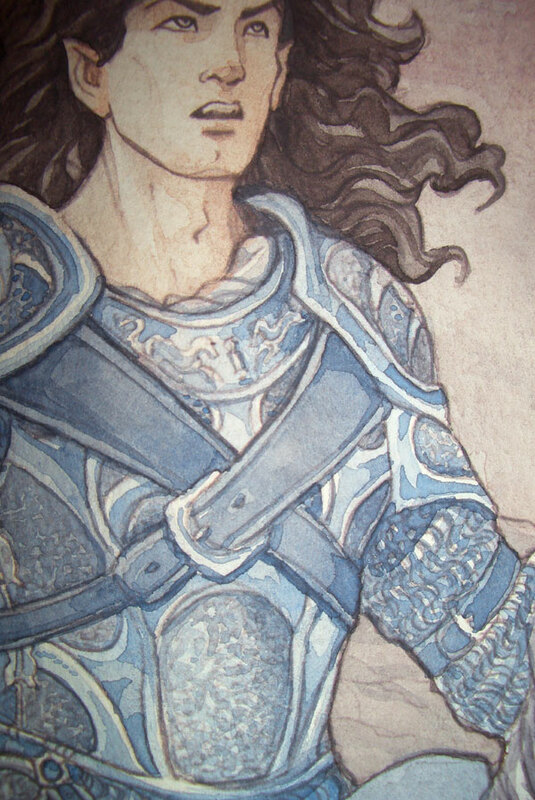 Closeup of the armour in the finished piece. Total time spent: Probably around 13-15 hours. An impressive work and very useful tips! Your work is absolutely fantastic. I have been following your deviantart for about as you have been on it, and it is just such a treat to see how piece after piece you just keep getting better and better. Absolutely breathtaking, and I cannot wait to see what else you do! Hi,Great work!I had a question about your process here. From what I read, it looks like you are doing the linework digitally, then printing it out and painting watercolors over it? What program are you using for the linework? And are you using a special ink or a special paper for the printed linework not to bleed? I've been thinking about doing this exact same thing, and am really interested in how you're accomplishing your results. They look great! Always love to see the steps, thank you :) Maybe one day I'll touch some water colours, though lack of ctrl+z worries me ;) The new Fingolfin is impressive, but I like the old one a lot, too. I Know it's the same theme, but now it's more like you presented us the boy from Aman vs the man from Beleriand.BTW, great song! Thanks all! DAE, not sure I can keep this up, but I'll do my best. 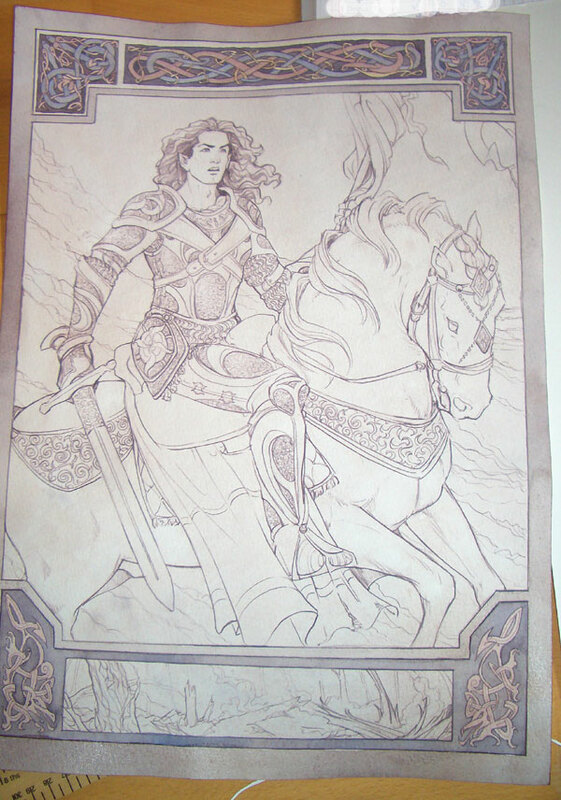 ;) Stephen: I do the lineart in Pencil, scan it, then print it out. :) The printer I have is an Epson; the only one I know that has 100% waterproof ink. 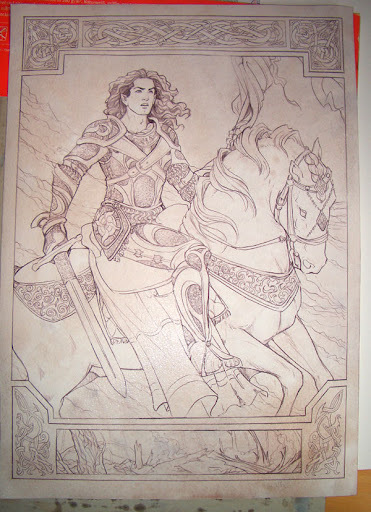 Before I got it, I used to have my lineart photocopied onto watercolour paper in a copyshop. 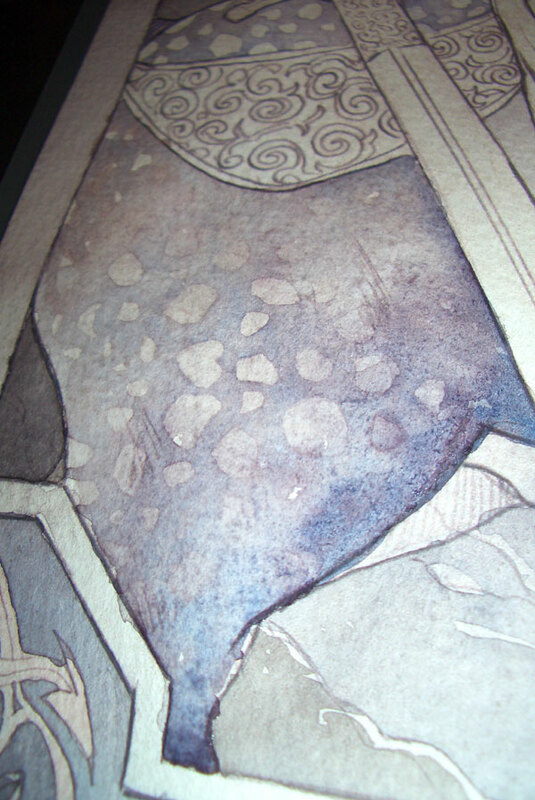 Hi again,I've been researching this process you're doing with the line art printed and the watercolors on top. I'm now recognizing there are LOTS of Epson A3 printers out there. What printer do you have? Is the paper you're printing on hot press or cold press watercolor paper? I'm trying to duplicate your experience on my Canon Pixma Pro9000 Mark II, using 140 lb cold press paper, but my lines are bleeding when I apply water. It's archival, and I would think it was a good enough printer for this sort of process, but now I'm having concerns… Perhaps it's not about print "quality" per se, but more about ink specifics, etc. or the type of watercolor paper you're using.Any help would be awesome. Thanks! Hi Stephen, yes, I'm afraid archival doesn't mean waterproof. The only 100% waterproof printer ink I've found (apart from laser printers) is Epson, which is always waterproof. It's got nothing to do with the paper. My printer is an Epson B1100. Ahhhh, hmmm. That's what I thought I figured out during my late night research binge. Needs to be pigment based ink rather than dye in. The high quality Epson printers all have pigment based ink, so I found out. What's your review of the b1100? I've read that it has some issues with ink clogging and with it really pushing through the ink super fast. I was thinking of getting a used Epson Stylus 2200 instead- I can get it on Craigslist at a pretty good price. It's older but seems to be have been of a higher quality than the b1100 when it came out. Do you know anything about it? How are the prints on the b1100 in general? I'd be using the printer for other stuff besides the b&w line art.